What would you do if you could go back to earth after you die? That's what philandering businessman Charles Cunningham finds out after he dies and goes to Purgatory, the place between heaven and hell. A cryptic note inspires him to go back to earth in search of the daughter he neglected in life, hopeful that he can make up for the past deeds that are keeping him out of heaven. Accompanied by the spirit of a 19th century writer, he lands in New York City in 2049. He doesn't know that another spirit, one of his jilted lovers, has followed them, intent on stopping him from doing anything that might get him into heaven. She has a long memory but not much in the way of conscience or a sense of humor, and she'll stop at nothing for revenge. 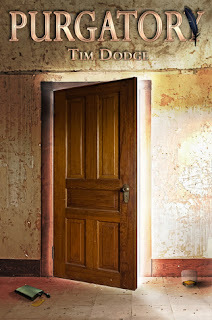 Tim Dodge takes readers on a ride to the spirit world and back with his novel, Purgatory. The characters are, to say the least, hilarious, the plot is incredibly well developed, while the writing style is wonderfully fresh and full of flavor. Though Charles Cunningham isn't the best person (he didn't go to hell -- so that's saying a lot), he is the main character of Purgatory. Not only does he find it relaxing to imbibe, Charles is also a voracious business man whose personality lacks in the departments of love and family. But he is willing to repent, even rectify his mistakes in life. Readers will connect with him based on his hope to become a better person and actually using the second chance he's given. Dodge writes Charles true to life. He's believable, understanding, and stubborn (in a he-doesn't-give-up-easily way). I think he follows the path most people would choose if they ended up in purgatory: Go back and give it another shot! This will only strengthen the bond that readers will have with him, intensifying their love for Charles and his story. Because of that, readers will love the plot that Dodge has crafted. Along with the extra elements of future technology, Edgar Allan Poe, and murder, readers will love this book! However, I must say that I don't think Ellen (jilted lover mentioned in synopsis) would have made it to Purgatory.I feel she would have immediately gone a little further south based on her insatiable need for revenge. All in all, this book does not disappoint. I feel that Purgatory creatively combines such a variety of genres that there is something for everyone who chooses to read it!